A very rare and uniquely handcrafted oil produced from ancient principles. 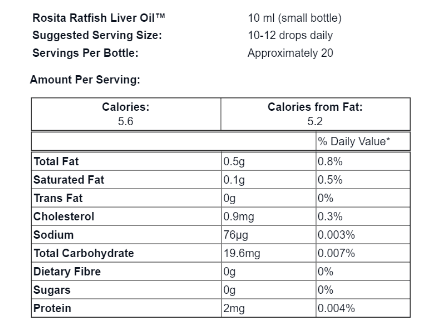 Ratfish oil has been revered above all other fish oils by Norwegian Vikings and Scandinavian fishermen for centuries. The very rare and uniquely handcrafted oil - produced from ancient principles given to us from nature - has shown remarkable properties through lab testing and usage. No heat or mechanical devices are used to extract this oil, only nature's ancient principles. Ratfish - chimaera monstrosa - is one of the oldest fish species known. It contains substances and DNA found in mammals, sharks and fish. The liver of the ratfish accounts for more than 60% of its total weight. The ratfish (also called rabbit fish) is not the same as skate fish or ghost shark, and is not even closely related to these species. Each 10 ml bottle contains approximately 230 drops. - Standard use: 10-12 drops once daily. - Intensive use: 10-12 drops twice daily for 6 weeks. This product is not intended to diagnose, treat, cure or prevent any disease or health condition. Discontinue use if adverse reactions occur and consult a doctor.